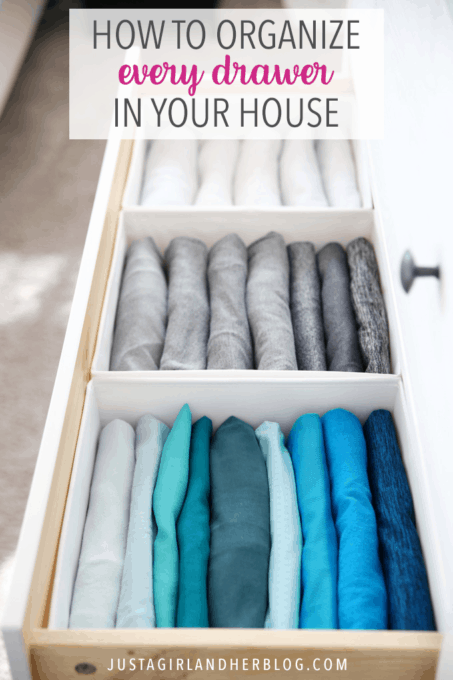 Organize every drawer in your house with these simple tips and tricks and beautiful inspiration photos! I’ve organized a lot of drawers over the years. Dresser drawers, kitchen drawers, bathroom drawers… I’ve organized them and re-organized them and updated them, trying to find the way that makes the most sense for the purpose we needed them to fulfill. 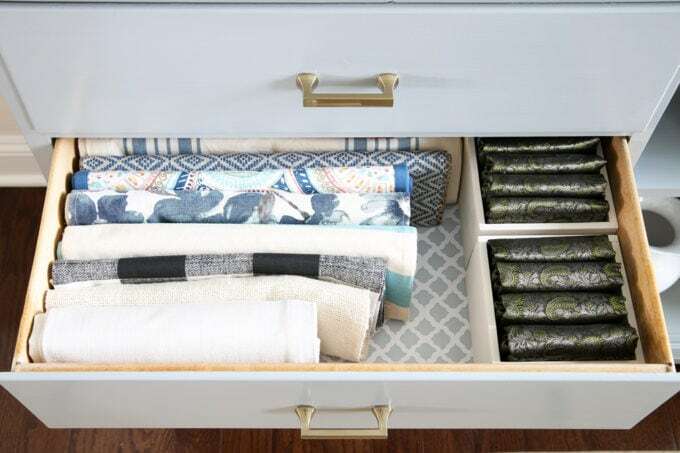 I thought it would be fun, then, to get all of our organized drawers together for a little “drawer tour,” first, because drawers are surprisingly pretty, but also to share some inspiration or ideas with people who may be looking to get their own drawers more organized! 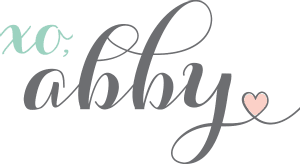 Let’s start with my favorite drawers– the dresser drawers! 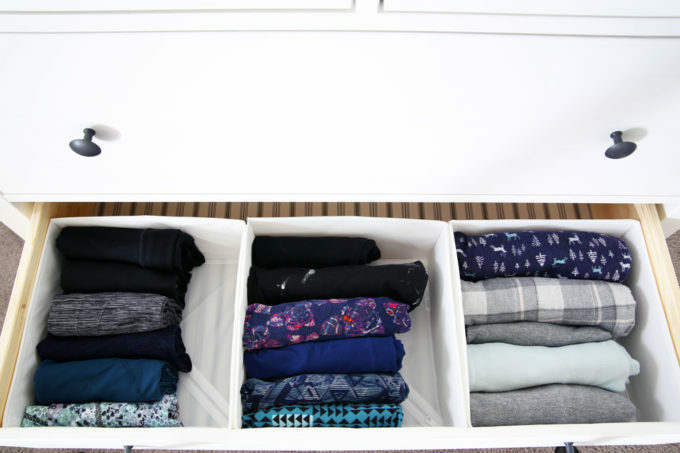 We started using the filing method of folding (aka the KonMari Method) about four years ago, and it was a total game changer. 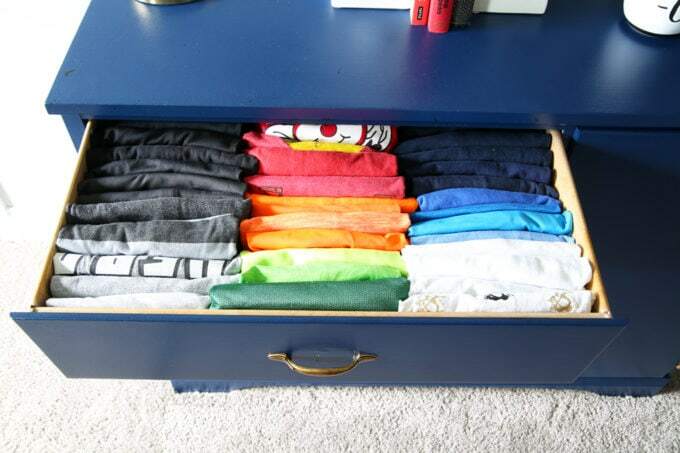 I love it because it allows me to see everything in the drawer at the same time, without having to sort through piles of clothes to find what I need. Sometimes if the clothes need a little help standing up, I will add bins to help divide the space and add some extra support. These SKUBB boxes from IKEA are perfect drawer inserts! 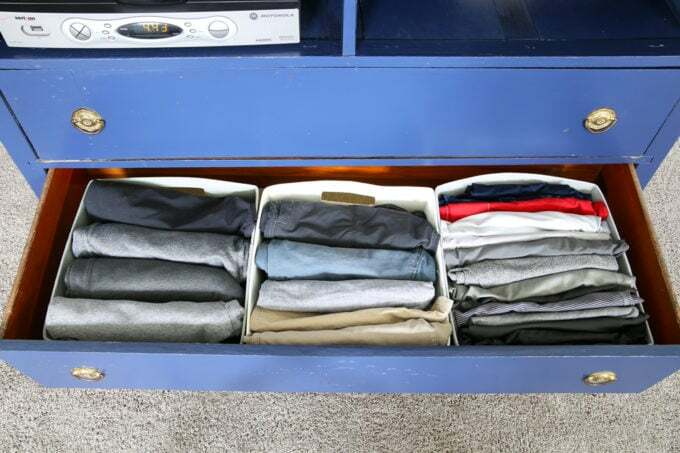 I used bins similar to these in Donnie’s shorts drawer. 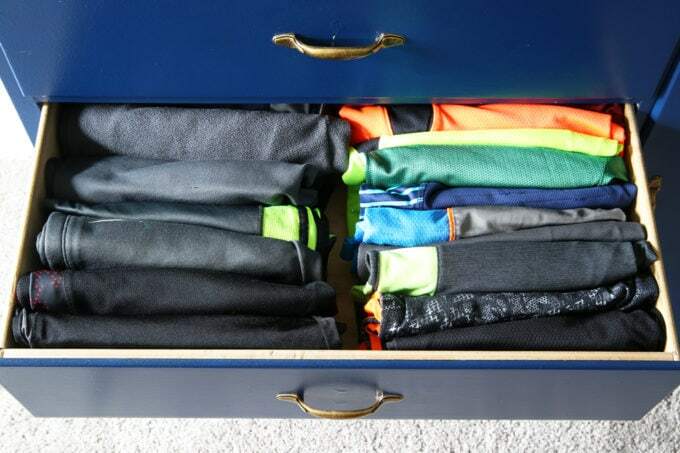 Our boys share a room and there is only space for one dresser, so using the filing method is the only way I could fit both of their clothes in such a small amount of drawer space! Being able to see all of their clothes helps them be more independent; they can grab their own items whenever they need them. 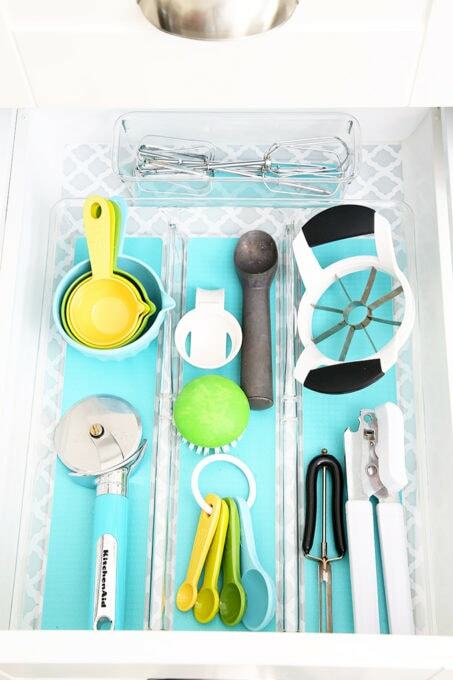 We use the kitchen so much that having organized drawers is a must! The cooking process is so much easier when we can quickly find everything we need. 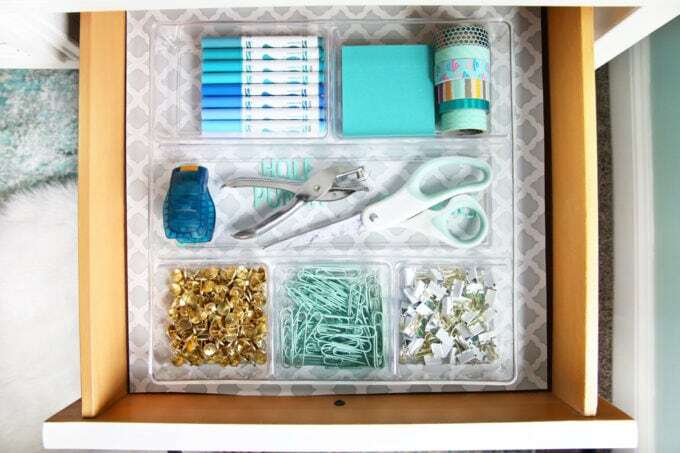 I love the combination of a pretty drawer liner + acrylic organizers– so practical and beautiful at the same time! 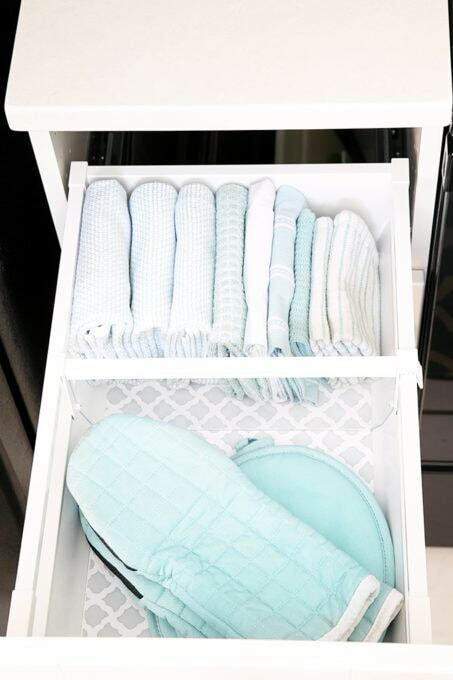 This drawer liner is my favorite– I use it all over our house! 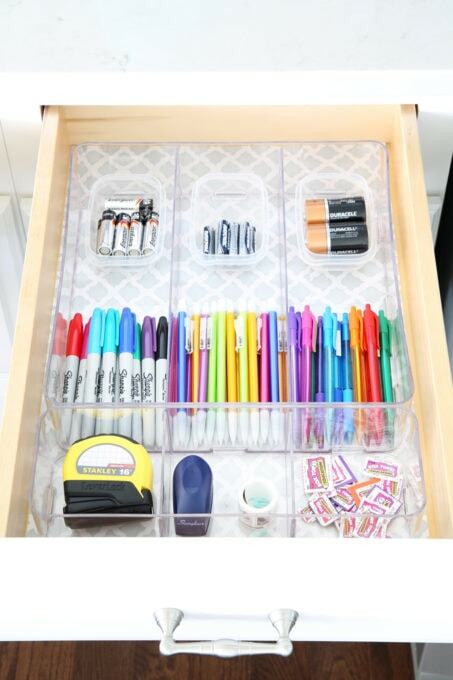 They don’t sell my exact drawer organizers anymore, but these ones are very similar and you could use a colorful drawer liner with them! 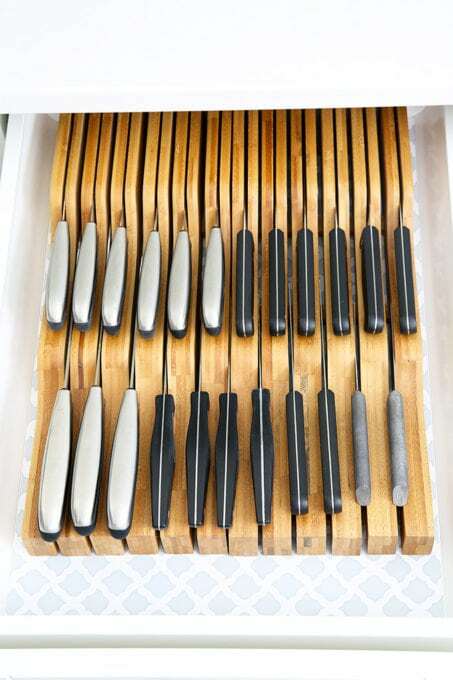 I switched from a knife block on the counter to an in-drawer knife organizer several years ago, and I don’t think I’ll ever go back. I like having the freed up space on the counter, and the knives stay neatly tucked away. 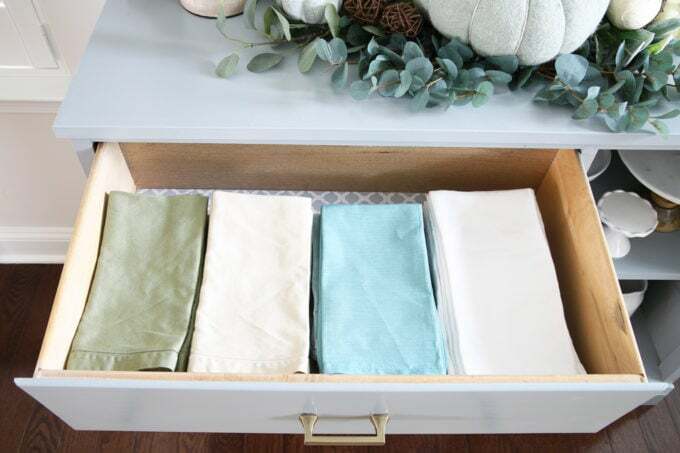 I use the filing method of folding for our dish towels and washcloths too! This shot is from our townhouse where we had an IKEA kitchen, so the divider in this drawer is one of their kitchen accessories. 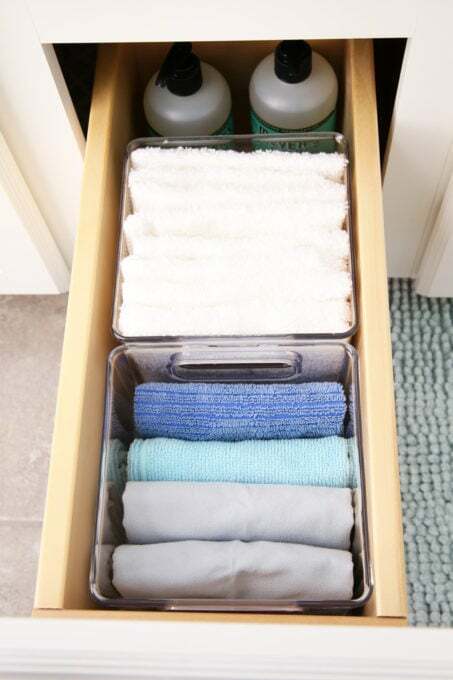 Bathroom drawers can be an organizing challenge because the drawers are typically deep and narrow, causing everything to fall over and get messy easily. 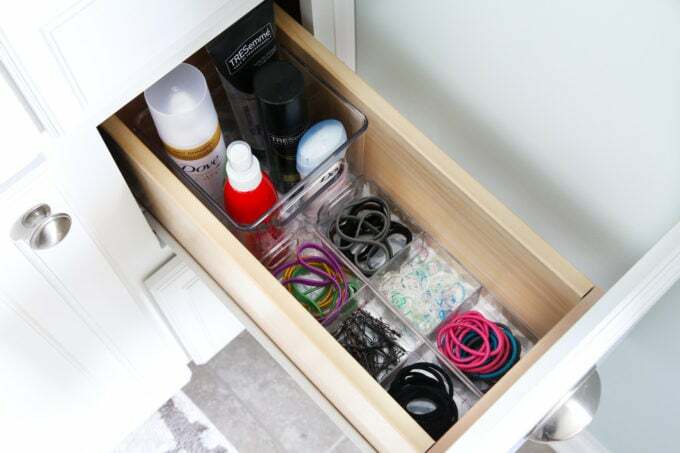 I’ve found a few different drawer dividers that are the perfect size for bathroom drawers and help to remedy the falling over problem! 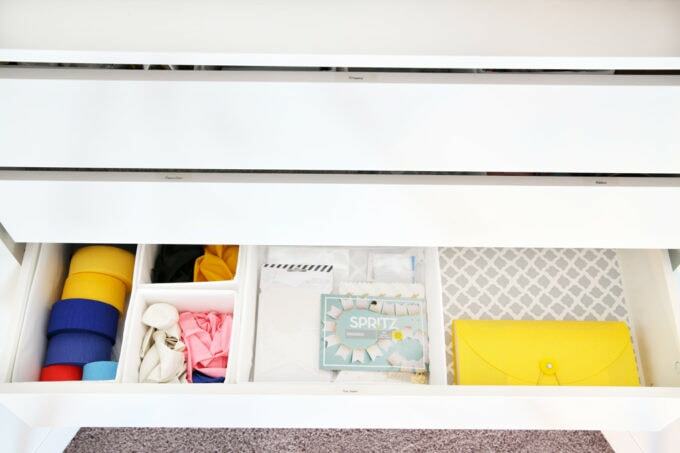 Two of these three-part organizers side-by-side are the perfect combination for corralling smaller items like hair accessories. 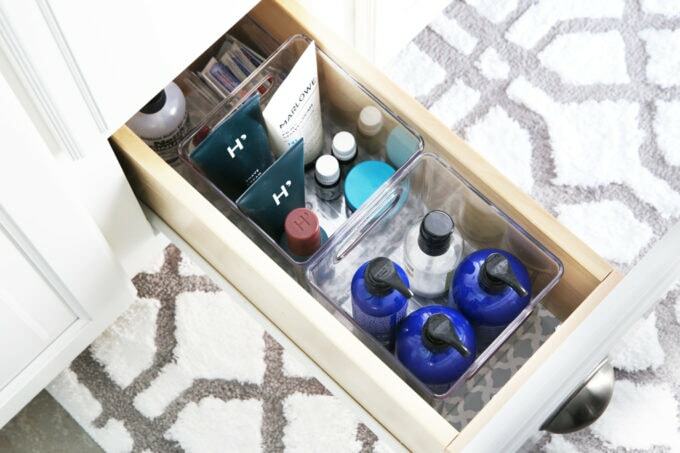 I also use a ton of these 6″ x 6″ acrylic bins in the drawers in both of our bathrooms. 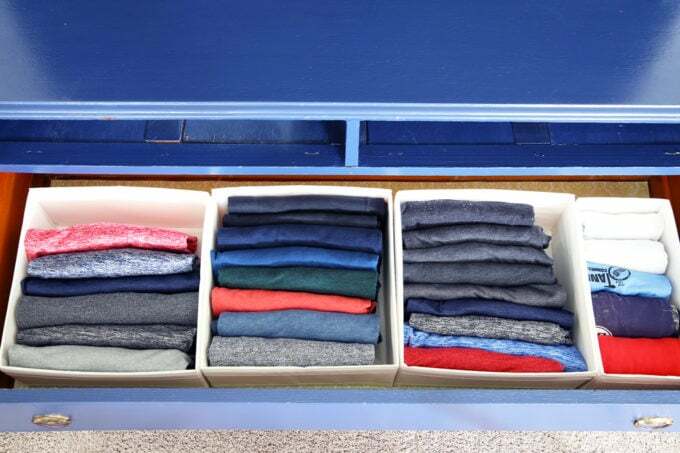 They are the perfect way to divide up the drawer and keep it tidy. 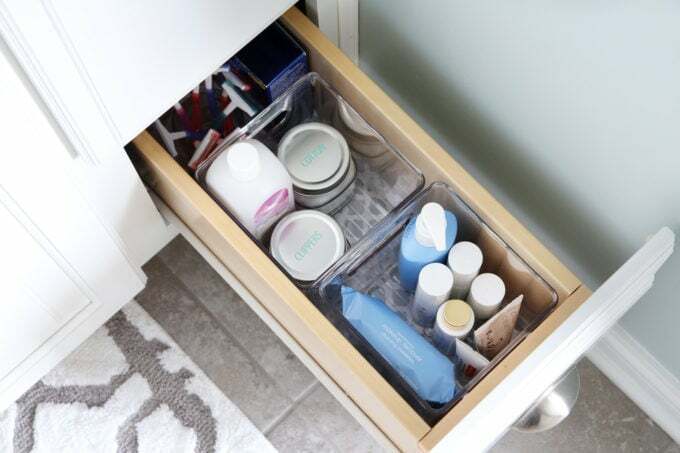 The 6″ x 6″ bins are great for holding everything from nail supplies to lotions and creams to washcloths and rags. I am not using them in our bathroom drawers currently, but IKEA’s GODMORGON boxes also worked well for us in the past. 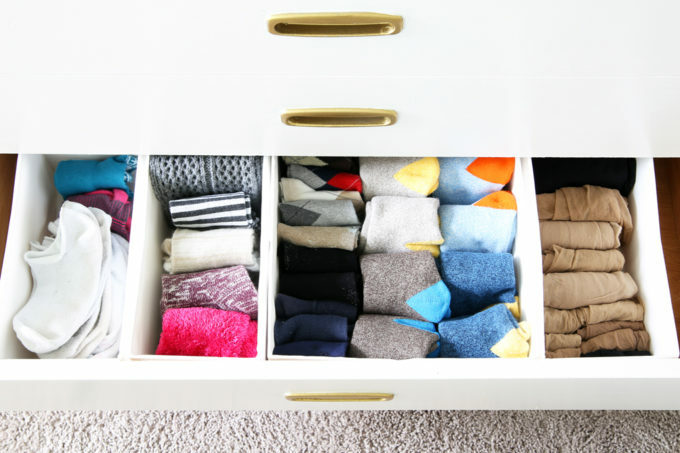 The junk drawer can easily become a huge mess, but the easiest way to keep that from happening is to create some division within the drawer so that everything has a spot! My exact drawer dividers are no longer available, but I love this set that you can easily configure in any number of different ways! 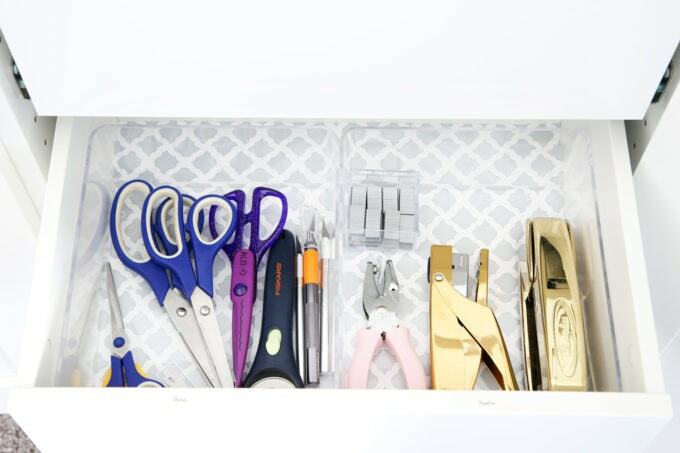 Our “junk drawers” are in our kitchen and contain office supplies, batteries, and tools that we use often so we can grab them quickly and easily. 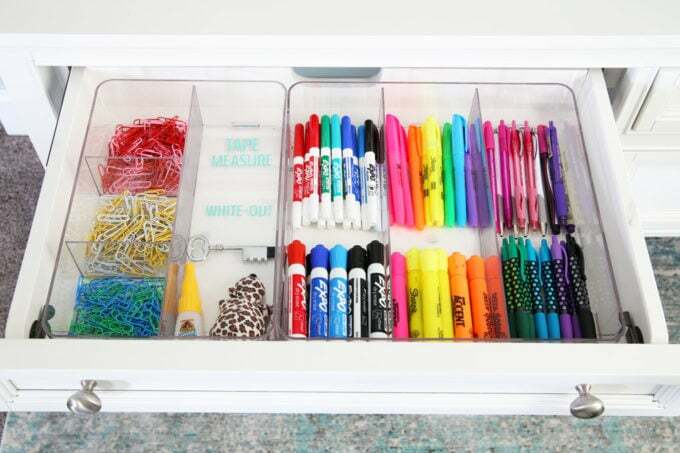 Office and craft room drawers are always filled with fun stuff! 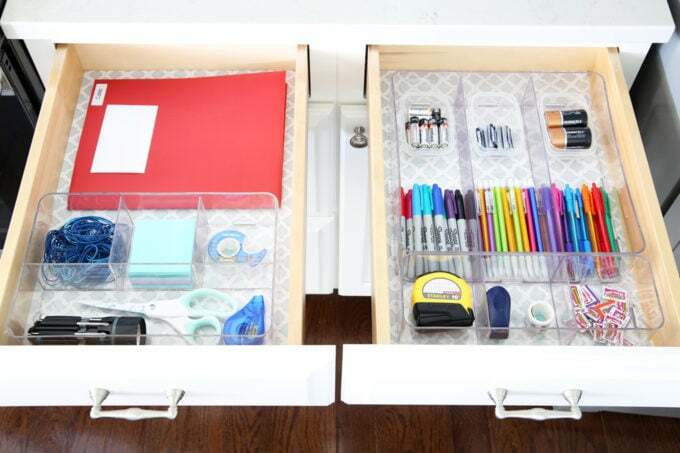 Again, when I’m working with smaller items like office supplies, I like to divide up the drawers with an organizer to keep everything neatly in its spot. 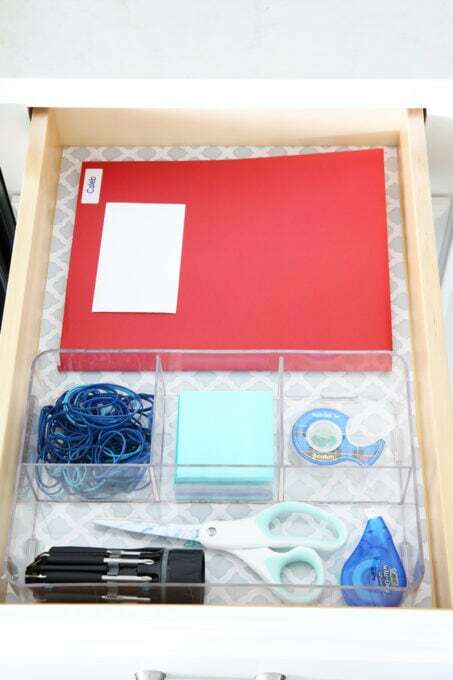 I used an organizer similar to this one to separate office supplies in my desk drawer. The organizers in my “sharps” drawer are from the IKEA GODMORGON set. Still using my favorite drawer liner too! The IKEA SKUBB boxes work perfectly to organize my drawer of party supplies too. 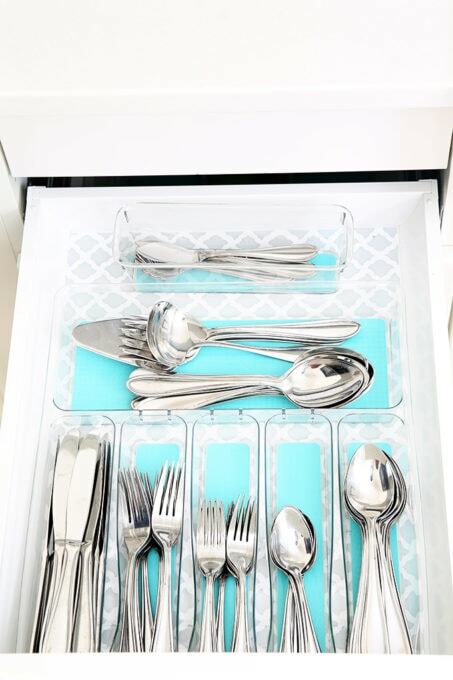 You can see all three sizes that come in the set in this drawer. They’re so versatile and can hold allll the things! 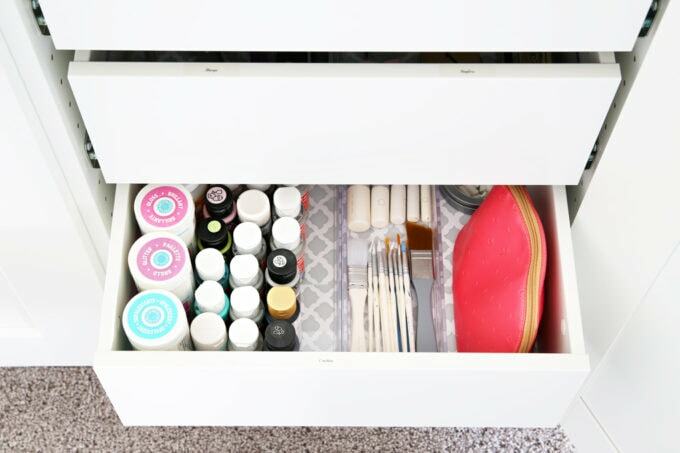 I used two more acrylic drawer organizers to keep my mod podge and painting supplies tidy. This is the larger organizer and this is the more narrow organizer. We don’t keep many DVDs around anymore, but I wanted to make sure the ones we do have were easy to grab and not just floating around in the drawer. 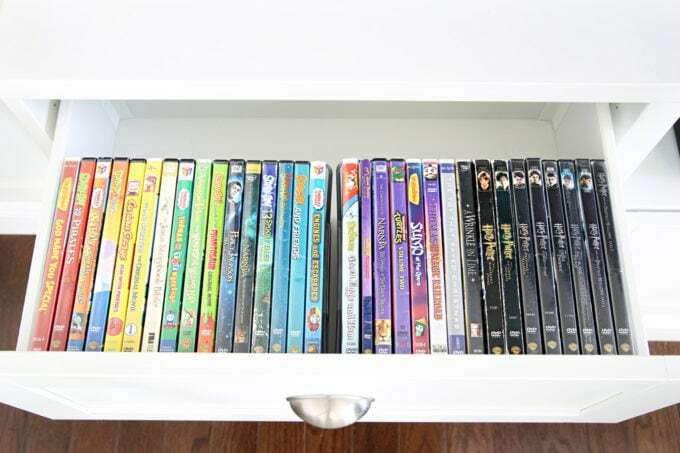 These bins (the 10″ x 5″ size) are the perfect size for DVDs, and they keep them upright so we can see the titles and pick the one we want. 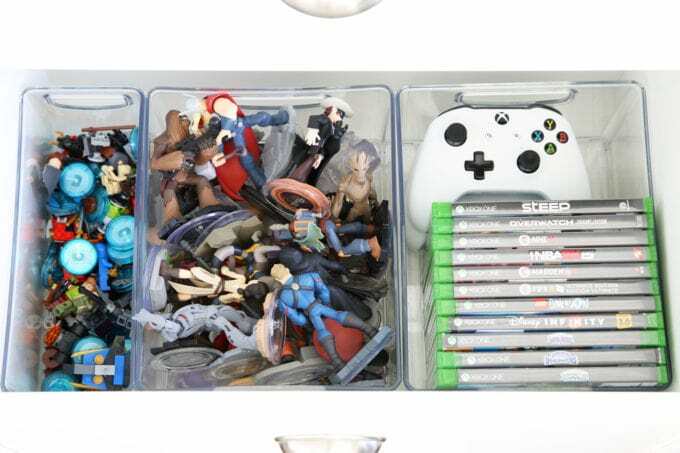 I used the same bins to organize our video games and the “guys” that go along with the games, as well as this narrower bin (the 10″ x 4″ size). Finally, the dining room! This room tends to be textile-heavy, so a simple repurposed dresser-turned-sideboard with several drawers was the perfect solution! Again, we used the file folding method to organize our tablecloths, runners, and placemats. Napkins are ordered by color and are easy to grab whenever we go set the table. Whew! So that completes our “drawer tour”! If you’re looking for any of the organizers I used, simply click on any of the images below for more details! Haha! Glad I’m not the only one who is! 🙂 Thank you, Ellen! What a great post! Thanks for sharing your tips and products. Great job! I love all the containers! I am inspired. Thanks so much, Elda! I’m glad it was helpful for you! Thank you for the wonderful ideas! I have a problem with organizing very deep drawers in my kitchen. Do you have any ideas. This drawers are two feet deep. Hi, Maureen! I can’t say the I’ve ever seen a drawer that is two feet deep, so I’m having a hard time picturing it. 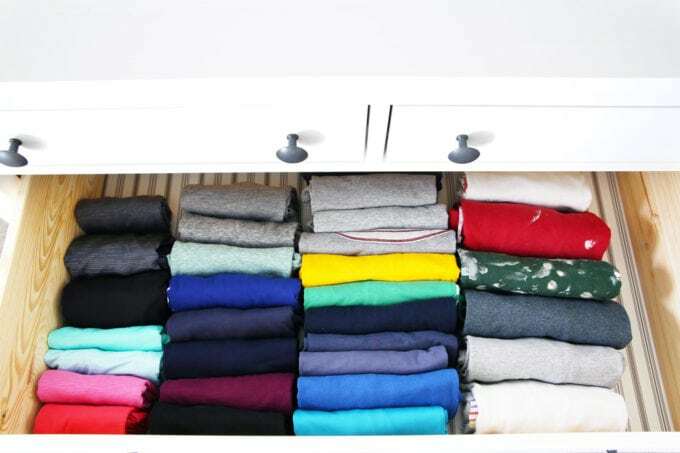 Without seeing it, my best suggestion would be to use stacking bins inside the drawer, with lesser used items on the bottom and more frequently used items on top. Good luck! This is EPIC! And so inspiring! Thanks for sharing us the inside of your drawers. The ROYGBIV color organization of your clothes makes my heart happy, too. Rock on, rockstar friend o’ mine!